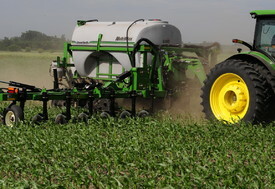 Unverferth Introduces NutriMax™ Liquid Fertilizer Applicator: Precision Placement For Optimum Plant Growth - Unverferth Mfg. Unverferth Manufacturing Co., Inc. announces its entry into the liquid fertilizer placement market with its new NutriMax™ liquid fertilizer applicator. The NutriMax applicator helps ensure optimum crop performance through the precise placement of nutrients when most needed by the plants during periods of high growth. The NutriMax applicator also features a rugged design for high-speed operation and an extra-tall 36” of toolbar crop clearance for a longer application window. The patent-pending side-folding toolbar provides a best-in-class narrow transport width of 14’9”. The toolbar is available in sizes of 60’, 66’, 88’ and 90’. The 60’ model folds to 40’ for dual-width application. The center frame section is constructed of dual, 5”x 7” tubes and single 6” x 6” tube on the outer wings for enhanced durability. Undercarriage choices include an adjustable axle from 88” to 140” to accommodate a variety of single and/or dual wheel sizes and row crop spacing. The NutriMax applicator is also available with 14”-wide Equalizer™ tracks featuring exclusive patent-pending cambering from front-to-rear and side-to-side with an adjustable tread width from 88” to 144”. Heavy-duty, six-bolt coulters are mounted with cast iron clamps for optimum performance and the user’s choice of straight or wavy coulters and injection nozzles or knife injectors to meet specific needs. Row spacings of 20”, 22” and 30” are available to match a variety of cropping practices. Models are available in capacities of 2,600 or 1,800 gallons with a specially designed triple sump for complete cleanout and optimum material flow. Undercarriage and wings feature a durable powder-coat finish of red or green along with a gray tank. Options include an inductor system for easily adding micronutrients from ground level and a steerable-hitch system for added steering control on end rows to minimize crop damage during turns. Unverferth Mfg. Co., Inc. is a family owned manufacturer and marketer of tillage, seed, hay- and grain-handling equipment along with pull-type sprayers and agricultural dual, triple and specialty wheel products. For additional information, contact Unverferth Manufacturing Co., Inc., P.O. Box 357, Kalida, OH 45853. Phone 419-532-3121 or visit the website at unverferth.com.